How does order emerge out of the multiplicity of bodies, objects, ideas and practices that constitute the urban? This book explores the relation between space, law and control in the contemporary city – and particularly in the context of urban ‘mega events’ – through a combined geographical and normative analysis. Informed by the recent spatial, affective and material ‘turns’ in the humanities and social sciences, Andrea Pavoni addresses this question by pursuing an innovative and trans-disciplinary approach, capable of accounting for the emergence of order in urban space both at the conceptual and empirical levels. Two overarching objectives are pursued. First, to account for the increasing convergence of logics, techniques and technologies of law, security and marketing into novel, potentially oppressive spatial configurations. Second, to envisage a consistent ethico-political strategy to counter this evolution, by rethinking originally and in radically spatial terms the notion of justice. Forging a sophisticated and original analysis, this book offers an analysis that will be of considerable interest to those working in critical urban geography, critical legal studies, critical event studies, surveillance and control studies. Organised around a novel treatment of the ‘event’ of urban life that moves between and entangles the ontological, genealogical and strategic, the book pays close attention to how normative orderings and forms and practices of control emerge out of the tangle of materialities and atmospheres that compose urban life. One of the first books to focus on the implications of the materialist and affective turns for law and justice, the result is an accomplished account of the ongoing formulation of sociolegal orders that is at once empirically rigorous and theoretically creative. 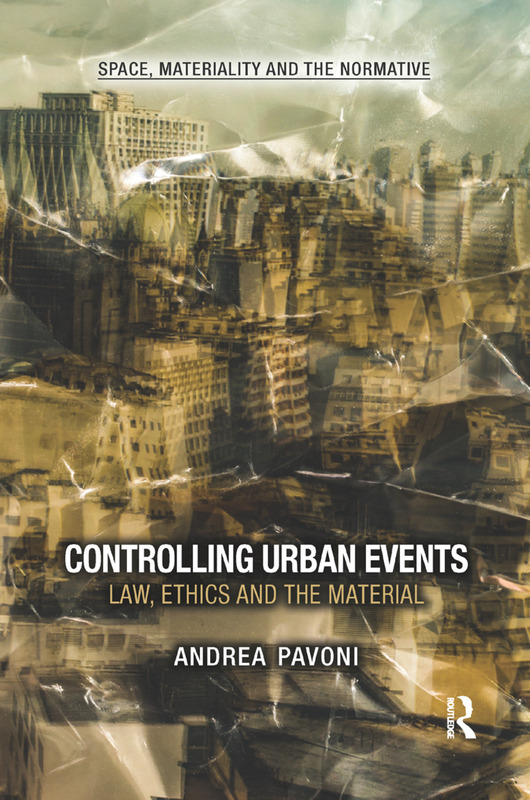 Pavoni has produced a theoretically rich, nuanced and highly energising book that takes the reader on a stimulating journey through the aliveness, tensions and productive contingencies of the urban as a space of in/justice read through a fertile convergence between philosophy, geography and law. Always alive to the potential evolution of new and oppressive logics of control, and set against the horizon of the contemporary neoliberal capitalist appropriation of the city, Pavoni carves out pathways towards deeply material, ethico-politically responsive and strategically resilient justice-making encounters. Pavoni never offers false closures—never settles for easy answers—but sets out signposts towards ongoing, responsible and radically material labours of urban justice-making. Anna Grear, Professor of Law and Theory, Cardiff Law School, UK. Pavoni offers us a tightly argued and rich perceptive insight into the philosophy of event; cognisant of the resonances and implications of its complexity as it unfolds across multiple domains. Through highly detailed reflections on key concepts within Deleuze/Guattari, Foucault, and others, he presents us with a comprehensive vision of the nuanced and intricate connections between surveillance and event, ethics and the law, and the dynamics of the sociality and materiality of space. Controlling Urban Events is a significant contribution to many disciplines, not least that of the emerging field of Critical Event Studies, and warrants a wide readership and substantial reflection; it will undoubtedly stimulate considerable, and most welcome, debate. Andrea Pavoni is post-doctoral fellow at DINAMIA'CET, Centre for Socioeconomic and Territorial Studies, at the University Institute of Lisbon, Portugal. He completed his PhD at the University of Westminster, London, in 2013. He is a fellow at the Westminster Law and Theory Lab, co-editor of the Law and the Senses Series (University of Westminster Press), and associate editor at the journal Lo Squaderno, Explorations in Space and Society. Space, Materiality and the Normative presents new ways of thinking about the connections between space and materiality from a normative perspective. The series is concerned with addressing the use, regulation and experience of space and materiality, broadly understood, and in particular with exploring their links and the challenges they raise for law, politics and normativity. The book series is intended as a critical interdisciplinary series, at the interface of law, social theory, politics, architecture, geography and urban studies.